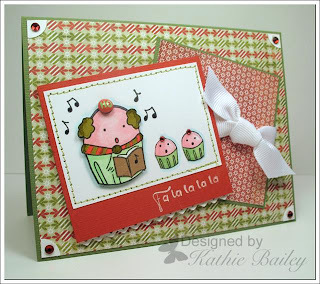 Stamp a Sweet Impression: Our Friday Friend Kathie! I live in a small town in Washington State called Hoquiam, which is just minutes from the ocean. If you are a fan of the "Twilight" series, you'll find my hometown mentioned there. I discovered scrapbooking, or more precisely, scrapbooking supplies about 7 years ago. I spent the next two years or so collecting every paper, ribbon and embellishment I could get my hands on. Then, in 2005, I stumbled across the Splitcoast Stampers website and was blown away by the talent and cards that were displayed there. I began buying stamps and making cards then and there and continue to be inspired by this hobby daily. I would describe my style as clean, colorful and ever changing. It's a rare card that does not contain patterned paper and ribbon somewhere. My favorite projects are definitely cards! I love the quick gratification you receive from creating a little work of art! My favorite TE image is the bowl of cherries from the "Berries and Cherries" set followed closely by the adorable Cupid Cuppie from "Love is Sweet". My guilty pleasure of choice is cheesecake! In fact, I've never met a cheesecake I didn't like. I make the following recipe several times a year and it is my family's favorite! Mix graham cracker crumbs and melted butter. Press on bottom and up 1" of the side of a 9 inch spring form pan.Combine eggs, cream cheese, sugar, salt, vanilla and almond extract; beat until smooth.Blend in sour cream. Pour into crumb crust. Bake at 375 degrees 35 to 40 minutes or just until set. Cool. Chill well, about 4 or 5 hours (filling will be soft). Serves 10. Thank you Kathie for being Our Friday Friend!!! How about you? Would you like to be Our Friday Friend? Simply remember to use keyword tayloredexpressions (NO SPACE) when uploading your TE creations to the gallery at SCS in order to be considered. And if you's like to play along with Taylor's sketch today just hop on over to her blog for details. Congratulations Kathie!!! Your Fa la la card is way too stinkin' cute!!! Looks like mommy (or daddy) Cuppie and the kids are spreading some holiday cheer!!! Awww, this is just adorable Kathie! Love what you did with the sketch too. :) Congrats on being the Friday Friend!! What a CUTE card, Kathie!! congrats on being our Friday Friend - sweet! !